What Does a Fire and Arson Investigator Do? If you've ever seen the result of a house or structure fire, then you know what kind of carnage an arsonist is capable of causing. Fire brings destruction, and it can be devastating to a family or business, even if no one is hurt in the process. To the untrained eye, fires cause total devastation without the slightest trace of evidence. Unless, of course, you're a fire and arson investigator. Most states and many local governments have established an investigative body to look into incidents of fire and arson. These agencies employ specially trained inspectors and investigators to root out the causes of fires to aid in future prevention and to bring criminals to justice. Fires present unique challenges to law enforcement professionals and thus require specialized knowledge and training. If you enjoy problem-solving and challenging puzzles and are interested in investigations, chemistry, physics, and fire science, then a job as a fire and arson investigator may be the perfect criminology career for you. Arson investigators generally do not initiate investigations but respond to requests from fire departments or other law enforcement agencies in the event of suspicious fires or circumstances. They may also work for private corporations, such as insurance companies, to investigate fires in the event it has been determined no crime has occurred. Fire and arson investigators may spend time working in laboratories and conducting experiments to learn more about how fires start and spread. They also study the effects of accelerants and the type of evidence they may leave, and share that information with other investigators. Fire and arson investigators are sworn law enforcement officers and work for state law enforcement agencies, police departments or fire departments. They are specially trained to identify and collect evidence relating to fires and make determinations as to their causes. They are also tasked with identifying potential suspects in the event they find that arson has occurred. Fire inspectors and arson investigators may also inspect structures, homes, and businesses to ensure they meet fire safety standards and regulations to prevent or mitigate the effects of a major fire. 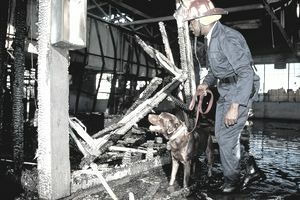 Investigators use a combination of crime scene investigation, interview, and interrogation techniques and knowledge of fire science to inspect scenes. They look for evidence of the use of accelerants, such as gasoline and other flammable materials, and work to identify the source, starting point and spread of fires. A fire and arson investigator salary varies based on the level of experience, geographical location, and other factors. The minimum requirements to work as a fire and arson investigator are typically similar to those of other police officers. College education: Fire investigator careers are among the many criminal justice careers that do not require a college education. However, in light of the scientific nature of fire investigations, a college education will be quite beneficial, particularly in criminal justice, criminology, and especially fire science or chemistry. Police academy: Because fire investigators are usually law enforcement officers, job candidates will need to attend a police academy. Some departments may sponsor academy training, while others will require candidates to obtain law enforcement certification prior to being hired. It's always best to check with your individual agency of interest for specific requirements before completing the job application. Experience: As with other detective and investigator careers, prior law enforcement experience is preferred and may often be required. Also, veteran's preference points are often awarded and candidates with past relevant work experience, education and training will receive preference in hiring. Certifications are available from several fire investigator associations. Background check: Employment as a fire or arson investigator will also likely require a thorough background investigation. It may include a credit check, criminal history check and perhaps even a psychological and polygraph exam. Training: Fire departments typically have a classroom section of the program in addition to on-the-job training. Communication skills: Firefighters must explain building codes and violations to property and building managers, and interview witnesses carefully when trying to resolve a case. Critical-thinking skills: Fire inspectors need to recognize code violations and recommend ways to fix the issue, and they must be able to analyze the evidence from a fire and reach a reasonable conclusion. Detail oriented: Fire inspectors must pick up on details when they inspect a site for code violations or investigate the cause of a fire. Physical strength: Fire investigators may need to move heavy debris out of the way at the site of a fire in order to get a more clear understanding of the scene. Almost 80% of fire and arson investigators work for local government. They spend their working hours in an office and out in the field. They examine office complexes and apartment buildings. They also visit the scene of a fire and may be exposed to smoke, fumes, poor ventilation, and hazardous agents. Fire and arson investigators usually work during regular weekday business hours, although they may also need to put in work hours on evenings, weekends and holidays because they need to be responsive if and when fires occur. Visit online job-search resources like Indeed.com, Monster.com, and Glassdoor.com for available positions. You can also visit the websites of individual city or county governments to apply to existing job openings. You can find certification information, locate training events, and find other resources to help you connect with job opportunities through industry organizations such as the International Association of Arson Investigators and the National Association of Fire Investigators.